The term “fine motor skills” seems sometimes to be used lightly without much thought to its actual meaning. 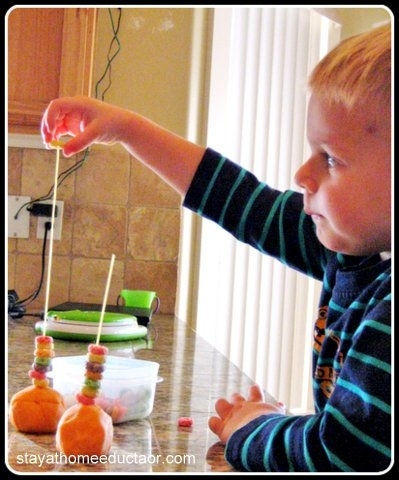 Fine motor skills involve the small muscle control in the fingers, hands, and wrists. Development begins in infancy, when a baby grasps for her mother’s finger, clutches a toy, passes a stuffed animal from one hand to another, or demonstrates mastery of the pincher grasp by self-feeding. Toddlers then begin to stack blocks, link rings, turn pages in books, and button shirts and zip coats. Fine motor skills are obviously integral to the daily activities of a child and the coordination of these groups of small muscles is a contributor to a child’s success in school. 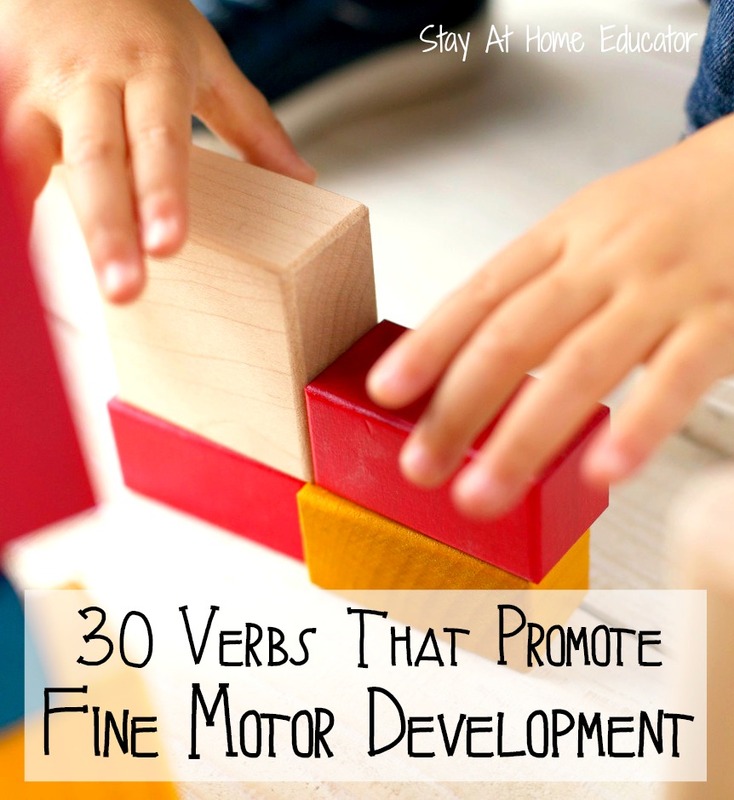 Many kindergarten readiness tests have a section to assess fine motor development. Skills such as the ability to cut with scissors, hold a pencil correctly, and tracing basic objects are evaluated. 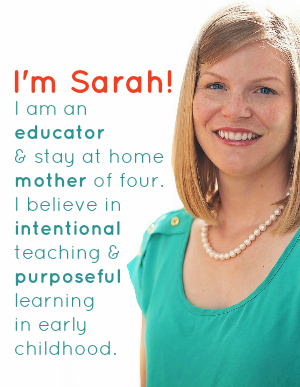 While kindergarten teachers agree that basic letter identification and number sense skills are helpful when entering school, some kindergarten teachers are now emphasizing fine motor development as even more important skills to have mastered before entering the formal classroom. Poor development of fine motor skills can be a factor in falling behind in reading and writing, not to mention the stigma that may be given by peers for a child not being able to perform basic tasks as efficiently as others the same age. 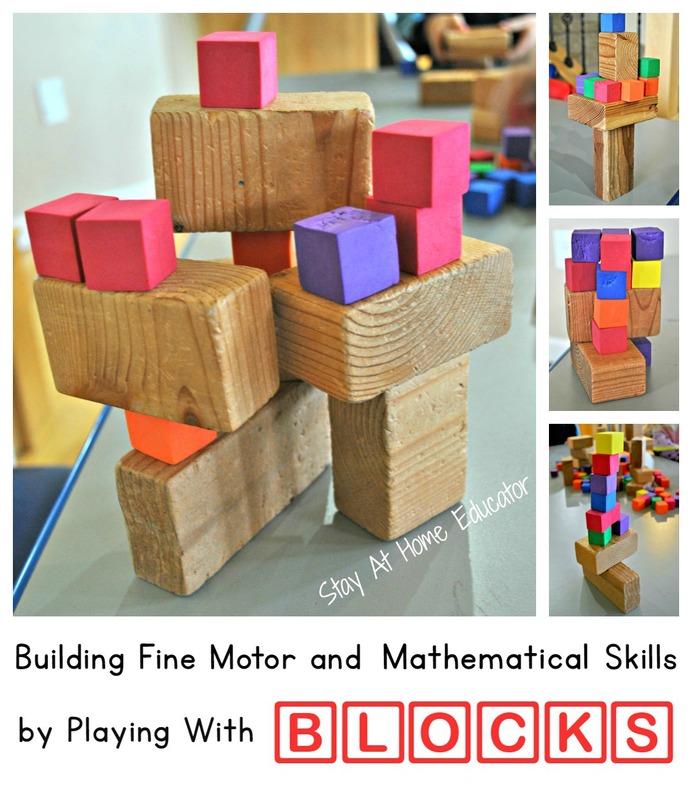 There are many opportunities within the home to reinforce fine motor development. Below is a list of basic activities that require very little preparation using regular household items. 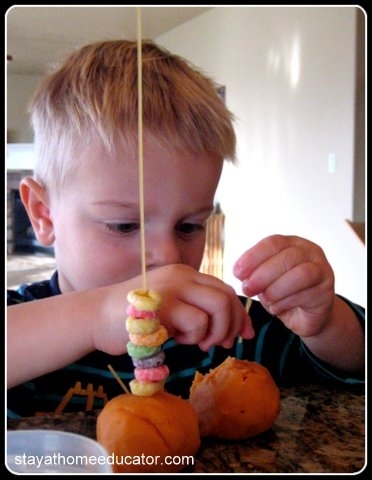 Stacking Fruit Loops on the dried spaghetti was fun, but as usual, William found more than once use for the provided supplies. William found it was fun to break the spaghetti into pieces and poke them into the play dough balls. 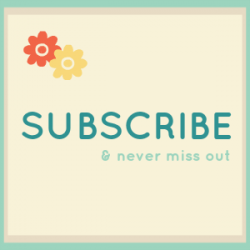 You may find that your child may be more interested in simply playing with the items you provide. This is ok. 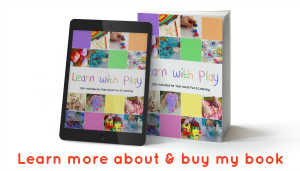 It is important to allow children to explore new items by encouraging play. 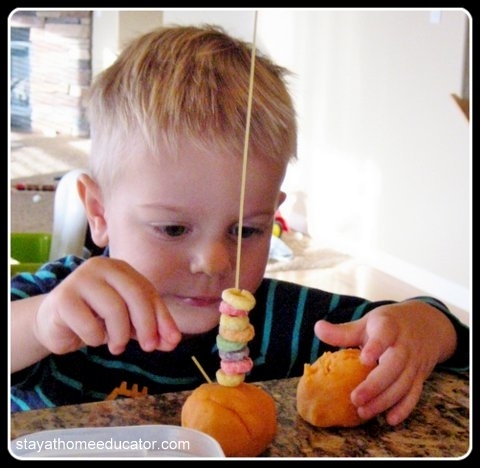 Through exploratory play your child will discover new ways to use and manipulate materials, and soon you will find that your toddler has stopped eating the peanut butter cookie dough and has begun rolling it into balls and using a fork properly to make criss crosses.